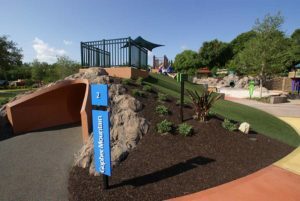 Are you confident that you’re making the best choices for your playground projects? It’s important that you know the safety products you install are environmentally friendly and safe for kids. 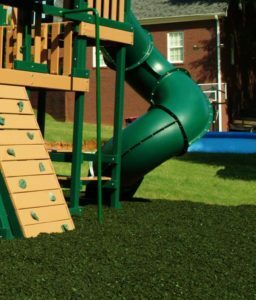 That’s why we at No Fault take great pride in providing rubber products that enhance playground and park safety – products made from the cleanest and highest-quality non-toxic materials available. 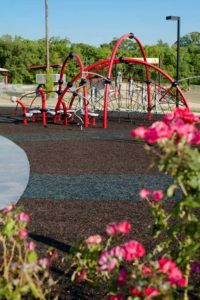 In the early days of rubber playground safety surfacing, a few sensational media reports claimed that recycled rubber might be too dirty or potentially contaminated with foreign particles. Today, however, there is no peer-reviewed scientific data that suggests recycled rubber poses any health risks to children, athletes or anyone else. On the contrary, more than 70 scientific studies conducted by both private and government entities specifically say otherwise, according the Institute of Scrap Recycling Industries, Inc.
Let’s take a look at how today’s most stringent playground safety standards depend on recycled and “upcycled” rubber and how manufacturers ensure that only the safest materials are used. Rubber has been recycled and repurposed for many years. But the market demand in the last few decades — a demand seen in places as diverse as hospitals, agriculture, sports, urban infrastructure, and parks and playgrounds – has meant an increased use of scrap rubber. Much of this rubber comes from old automobile tires that are no longer functional. In most cases, old tires ended up in the landfills. Worse, many were dumped in lakes, vacant lots, along the sides of roads, or on public property. Today, however, U.S. scrap rubber manufacturers recycle roughly 110 million tires annually. 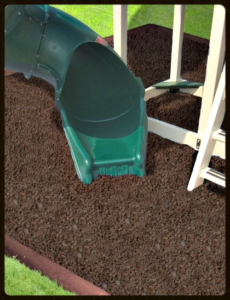 As it turns out, scrap tire rubber can be used to make reliable playground safety surfacing. 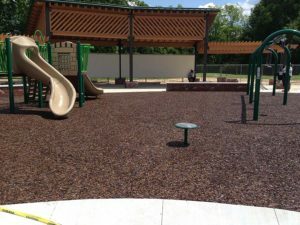 No Fault Safety Tiles, poured-in-place (PIP) surfacing, rubber mulch, timbers, and other playground safety products contain these “second-life” rubber components. These materials have undergone rigorous safety testing. 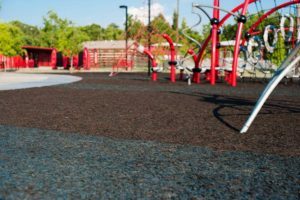 This testing (conducted by state and federal agencies and independent, third-party industry associations) has shown time and time again that recycled crumb rubber and other re-used rubber poses no harm to humans, animals, or the natural environment. In fact, research shows no significant health risks are associated with artificial (synthetic) turf made from recycled rubber infill. 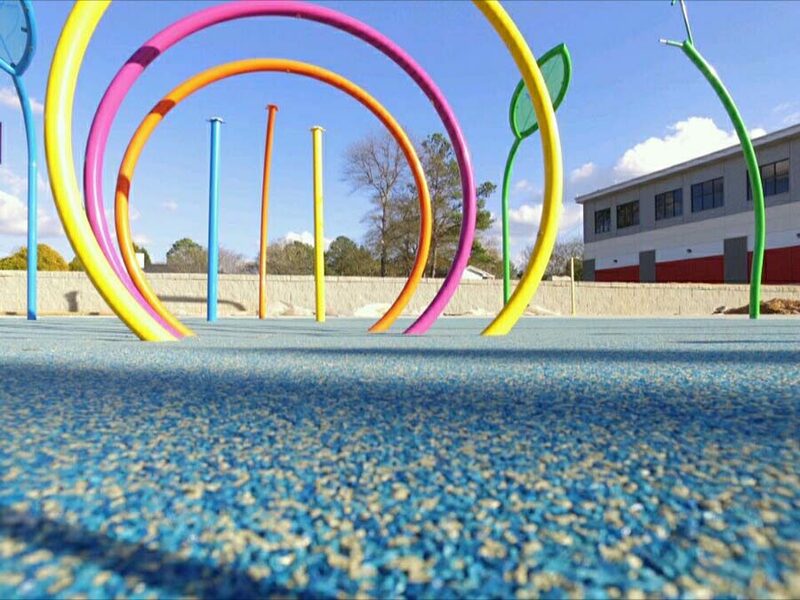 No Fault’s industry-leading playground safety surfacing products contain mostly postconsumer content. And what exactly is that, you might ask? Essentially, it’s defined as waste materials that can no longer be used for their initial purpose. “Recycling” is a more common term. It describes a sustainable process that involves creating a new product from an old one (using old aluminum cans to make new ones, for example). However, recycling is often too expensive to justify the process. The next best thing is “upcycling,” or reusing one material to produce something different. “Upcycling” is the process of taking a material that was already used for one thing and – instead of throwing it away – converting it into something useful. For example, we upcycle rubber waste to create high-performance safety surfacing. This waste comes from vehicle tires which contain traction and shock-absorbent properties. At tire recycling facilities, industrial shredders use powerful, interlocking knives to chop tires into smaller pieces. Tires may also be shredded through a cryogenic process, using liquid nitrogen to freeze rubber until it becomes very brittle. Powerful hammers then smash the tire apart, and cryogenic grinding makes a fine powder of the pieces. Non-rubber components (such as steel belts) are removed and used for metal recycling. The manufacturing process our products go through includes grinding and screening to remove stones, metal, fiber, and other materials from scrap tire rubber. This is an exacting process designed to meet rigorous ASTM specifications – as well as our own high standards. This vertically integrated, energy-efficient manufacturing process involves continuously testing and retesting products to maintain a high level of quality and trust. This process uses very little water and heat, plus scrap rubber is always reused to minimize waste. 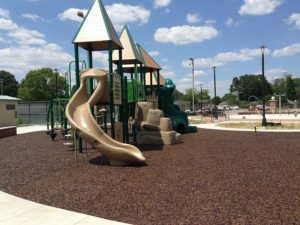 The use of manmade safety surfaces on playgrounds has increased over the years. 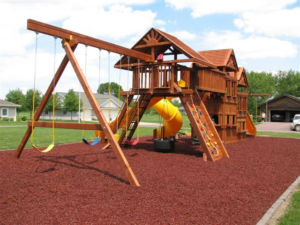 Today, both the Environmental Protection Agency and the Consumer Product Safety Commission recommend and promote rubber mulch as an alternative to wood chips. 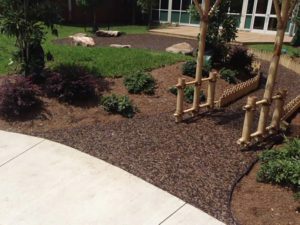 This mulch and other No Fault surfacing products are made from recycled (or “upcycled” rubber) that has been thoroughly cleaned, stripped of any harmful metal, and remanufactured to create tiles, mulch, and PIP rubber surfacing that protects against falls and other injuries. If you have any questions or concerns about our world-class safety surface products, please call us at 1-800-232-7766 to speak with a No Fault representative today.